Breadsmith of Fargo specializes in hand crafted artisan breads made fresh from scratch using only the highest quality ingredients with no additives or preservatives. When they say “made from scratch” it truly is and also the daily bread is never frozen. Products are baked in a 13,000 pound, stone hearth oven imported from Europe that is nothing short of awesome. A midwest based company, every Breadsmith location believes in “quality over quantity.” Rob Roberts, owner of Breadsmith Fargo brings that same approach and his team takes it to the next level with their passion, cleanliness and smiling faces to every customer that walks thru the door. I always thought that bread was “just bread” until I experienced Breadsmith. Everyone loves getting “the best product at an affordable price” and Breadsmith does exactly that! Here is a great example of a small business that is truly connected to the community of Fargo Moorhead and loves giving back. You will also be happy to know that Rob and his team donate their time and products to those who are in need. They donate bread to shelters and soup kitchens, as well as generous gift certificates and bread orders to assist local fundraisers. “We’re looking for ways to make the in store experience even easier for the customer.” says President Tim Malouf. Go click around and zoom in on the 360 Virtual Tour above at Breadsmith of Fargo. You can do everything but smell the fresh bread. Check out all the daily fresh bread and remember they also make specialty breads and a wide range of cookies, muffins and sweets. https://i1.wp.com/local360.net/wp-content/uploads/2015/09/IMG_1693.jpg?fit=3888%2C2592&ssl=1 2592 3888 Benjie https://local360.net/wp-content/uploads/2015/12/Local-360-Logo-WP.png Benjie2014-12-09 01:32:512016-02-17 20:37:09Client Focus: Breadsmith Fargo - "See Inside"
Walking thru the front door at Spicy Pie NDSU gives you a fun, creative energy that just feels great. A Google Street View | Trusted 360 interactive tour allows you to feel that energy by seeing 360 degrees in every direction. While you may wonder why it’s important to see every angle, you only need to take a look straight up. You will find ceiling tiles with very unique artwork. 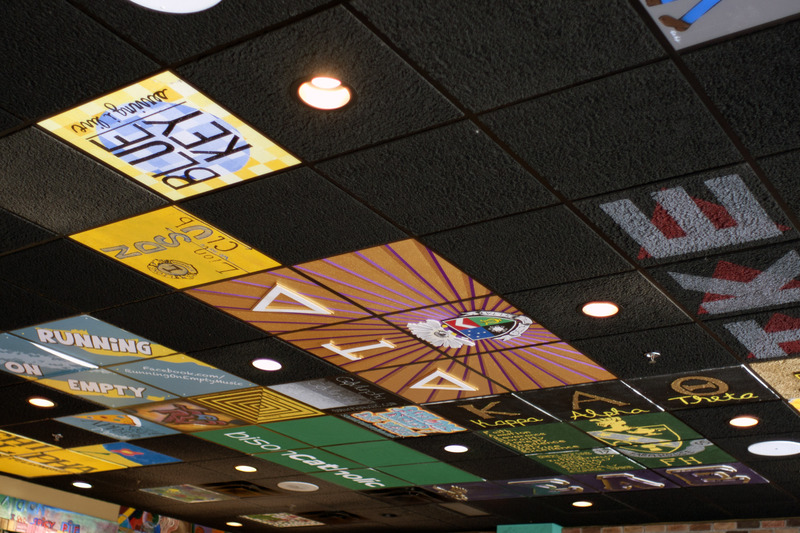 Creativity is something that every Spicy Pie location does an amazing job displaying. Spicy Pie is a local Fargo based company that has brought New York style pizza to the midwest. These pizzas are HUGE…18″ to be exact and watching the team make your pizza from scratch is a treat in itself. I have never seen a guy toss a pizza so fast and high before. Someone said he was Italian, and it was genetic. You can order just a slice of pizza with whatever toppings you please, order a cold beer, have a soda, enjoy some wings, try out a grinder sandwich or pick anything from the excellent menu items. Getting back to those ceiling tiles, they can be purchased. So you can create your own design and display it at the restaurant. NDSU students, you can use your Bison Bucks at the Spicy Pie NDSU and get great deals on t-shirts plus other items, Go Bison! If you are visiting your son or daughter on the NDSU campus just walk across the street. You will able to experience the unique atmosphere at Spicy Pie NDSU. If you can’t make it to Spicy Pie NDSU soon, they have locations in Downtown Fargo, West Fargo, Moorhead, Minot and also Grand Forks. Check out each location’s unique decor and atmosphere. Looking to attract more customers? We would be happy to help showcase your business and invite customers to “See Inside” by creating a Google Maps Google Street View | Trusted 360 Virtual Tour for you! It’s the only way to Instantly Double your visibility on Google. Spicy Pie is a North Dakota company that specializes in hand-tossed pizzas, grinders, wings, and more. There are locations in Minot, Grand Forks, and 3 locations in Fargo. Beer is available at all locations, liquor at some. While there is often a line at meal times, the wait us usually short. Eat in, take out, or have it delivered. I remember the first time I walked into Spicy Pie, I wasn’t sure if I was still in downtown Fargo, or uptown NYC. The historic building, and decor gave it a big city vibe. As did the generous sized slice of pizza with your choice of toppings, at an affordable price. Even graffiti on the walls. New York style. The atmosphere is fun, and so is the staff. The exposed brick and lots of wood helped contribute to a great looking photo tour. Click and drag (or touch) the tour above to experience it for yourself. Of course to experience the smells and the flavors, you’ll have to visit in person. Please contact us at [email protected] or call (800) 358-0101 for more information.